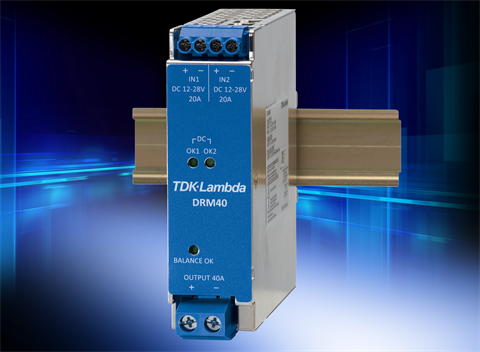 TDK announces the introduction of the DRM40 series of DIN rail mount redundancy modules. Two 10V to 30Vdc inputs are rated at 20A each and the output at 40A. A 150% peak load capability for four seconds is provided for capacitive and inductive loading. The internal MOSFET reverse current protection devices have a low 200mV drop, reducing voltage losses in the module. The DRM40 series is housed in a metal enclosure, measuring 124mm in height, 125mm deep and a width of 35mm. The modules are rated for full load operation in -40°C to +70°C ambient temperatures. Both units are safety certified to IEC/EN/UL/CSA 60950-1, IEC/EN/UL/CSA 62368-1 and UL 508, and CE marked for the Low Voltage, EMC and RoHS Directives.